Galway athlete Alanna Lally ran the race of her life, running for Ireland at the European U23 Championships in Bydgoszcz, Poland, last weekend, placing fourth in the European U23 800m final in a time of 2:05.63. Lally, a multiple juvenile champion with Galway City Harriers and now a UCD college athlete, closed with a storming last 100m, and just missed out on bronze by an agonizing one tenth of a second. Lally had a great championship, setting a new personal best in her heat where she was third, and proved her championship credentials in the final, moving from ninth at the bell to fourth, with a superb finish. This performance is a testament to the hugely talented and hardworking athlete and augurs well for future championships. The final weekend of the National Juvenile Track and Field Championships was held in Tullamore over two days, and once again Galway athletes performed superbly and won multiple medals. Loughrea athletes had a superb championship, winning double gold, triple jumper Brendan Lynch set a championship best in winning the U19 boys' triple jump, with a huge jump of 13.84 metres, and his clubmate Daniel Callanan Forde leapt 13.47 metres to win gold in the U18 boys' triple jump. 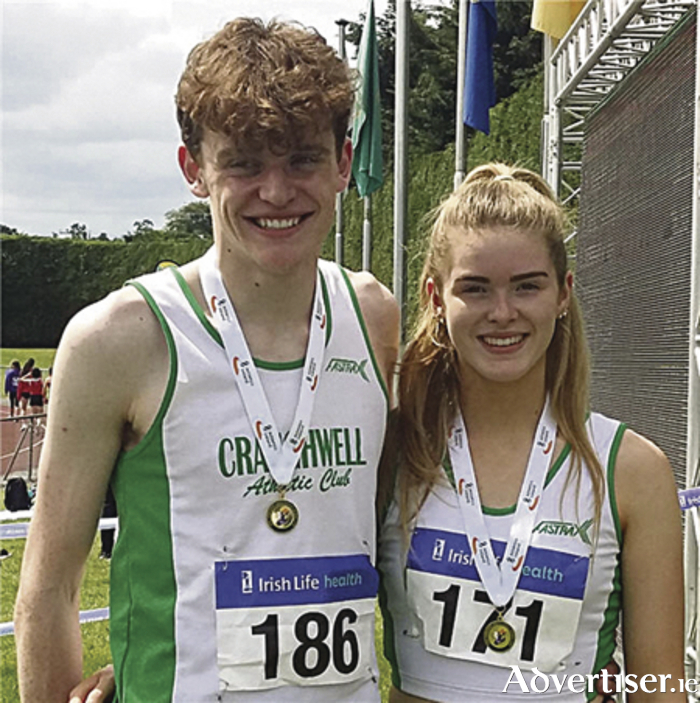 Craughwell AC won double gold in the field, with Laura Cunningham winning the national U18 triple jump title, with a best jump of 10.63 metres, and her clubmate Jerry Keary leapt to victory in the U18 high jump with a 1.99m best. Cunningham later added her second medal of a very successful day with a brilliant bronze in the U18 girls' high jump. Conor Trehy also of Craughwell won bronze in the U15 boy's triple jump. Craughwell AC's Chloe Casey won silver in the U16 girls' shot putt, throwing 12.77 metres, to round off a brilliant season for Galway’s juvenile track and field athletes. Emma Moore of Galway City Harriers won the U14 girls' 200m in a new personal best, a fast time of 26.18 seconds. Darragh Jennings also GCH won silver in the U14 boys' discus, with a throw of over 33 metres. Aoife Sheehy impressed for GCH, taking national silver in the U18 girls' 400m hurdles, while clubmate Seren O Toole secured a silver in the U16 girls' 250m hurdles. Athenry AC athlete Ryan McNelis won silver in the U18 boys' 400m hurdles, in a 56.81 personal best, with Diego Brule of GCH winning bronze in the same race. The most prestigious track and field event of the year, the national senior championships, takes place next weekend in Santry over two days. Galway will be well represented, with Sean Breathnach of GCH looking for a medal in the shot putt and discus, distance runner Gary Thornton also of GCH going in the 10,000 metres, and Keith Fallon of the city club taking on the 5,000 metres event. East Galway AC hosts a 5km run on this Saturday at 6pm in Skehana, and there will be a children’s fun run at 5.45pm in advance of the main event.